Living 2+ hours away from my mother makes being present in each other’s day to day lives a little tricky. We call, of course, and chat on Facebook. I send her pictures of The Squish a few times a week as well. I wish, though, that I could be more near on the crummy days, or even just the mundane ones. I wish that I could let my mom know how special she is and tell her to drive safe before she rushes off to work in the morning. Now, I can! This Christmas my brother bought my mom a great single serving Kuerig machine that she loves. Since my dad passed, she hasn’t had the need to brew a full pot of coffee, and was getting by with awful instant coffee packets. Now, most mornings my mom makes her self a hot cup of coffee before she heads out the door. 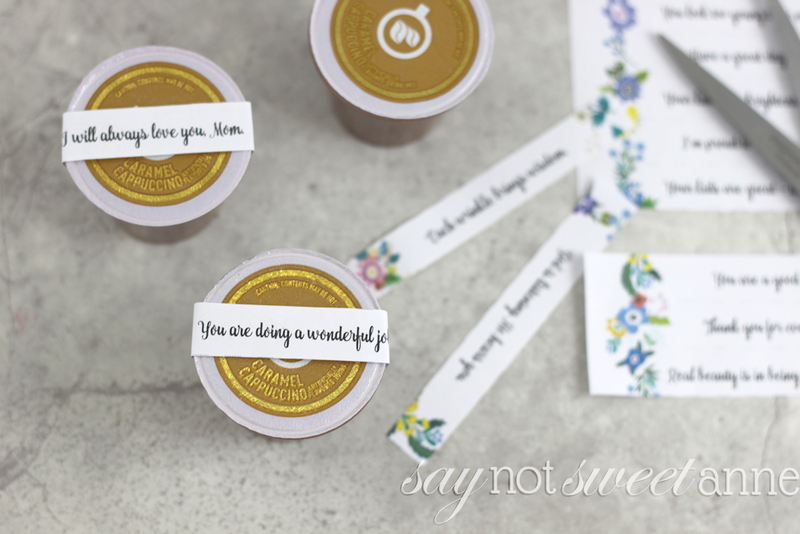 Starting this Mother’s Day, those cups of coffee will come with a sweet little note from me to her. 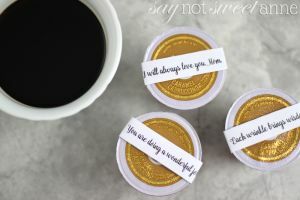 I’ve purchased a few compatible cups, and made an adorable free printable filled with kind and uplifting sayings. 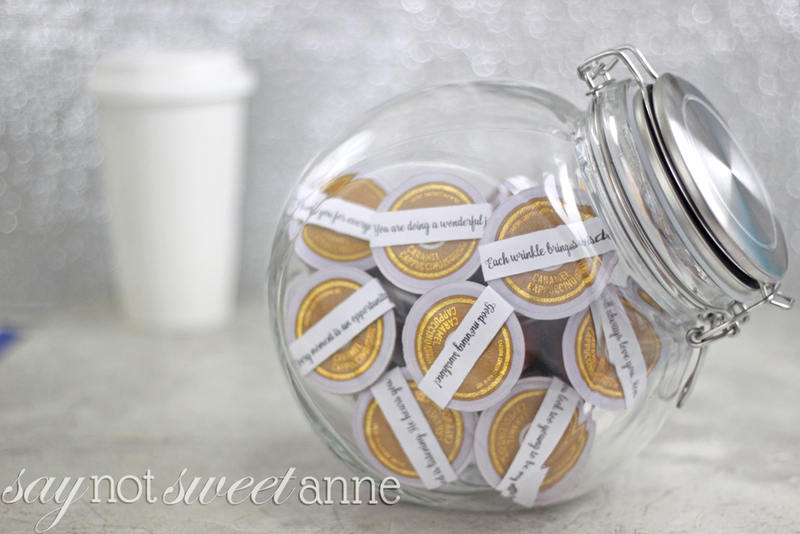 Put them together in a lovely jar and suddenly, the miles between us don’t seem so bad. 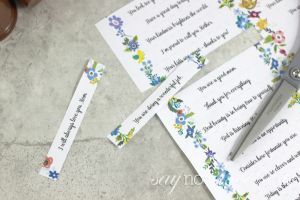 Print out the printable and cut out the phrases. Toss any that don’t suit you or your mom. 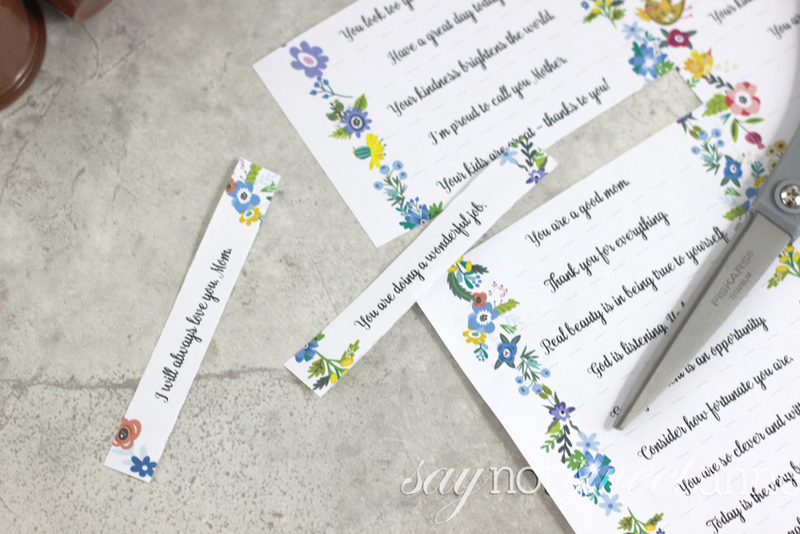 There are even blank spaces to hand write a few special sayings just for you two. Using your glue method (not hot glue, you don’t want it to melt in Mom’s Keurig), place the phrases over the top of the cup and secure. It’s important that Mom can remove the phrase before using the cup. We wouldn’t want to be responsible for any damage to Mom’s coffee maker! 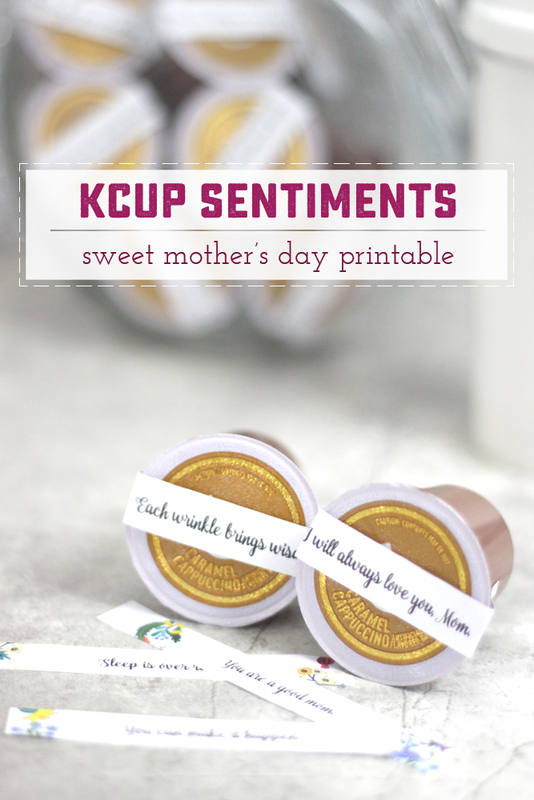 Put your cups into a pretty jar, package them with a lovely coffee cup, or just sneak into Mom’s kitchen and replace her stash with your newly sentimental ones. What a sweet way to wake up in the morning! Of course, you don’t need KCups to make this gift work. You could attach the phrases to all the tea bags in your mom’s tea collection. You could hide them in special places around her house,Or just put them in a jar with instructions to choose one whenever she needs a pick me up.